Live Music Fridays- Ken Jones and Bryan Miller Duo! First Sunday Dog Wash and Fundraiser! Bring your furry friend to PAW for a bath! All proceeds go to Friends of Strays. $10.00 donation per dog! Nail clipping, quick trims and drying also available. Did we mention that all proceeds go to friends of strays? It's lots of fun, and we've already raised over $2000.00 for Friends of Strays! Pet Pal Yappy Hour at PAW happens the second Thursday of each month! Bring your dog, grab a beer, and help us raise money to support our friends at Pet Pal Animal Shelter! 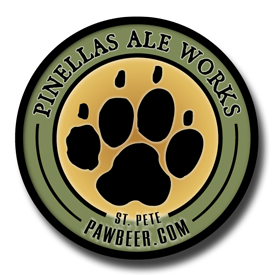 PAW will donate $1 from every pint of PAW beer sold from 6-8PM! If you'd like to support another local shelter, check out the Friends of Strays Yappy Hour on the 4th Thursday of each month! Cheers! Pedal on in the second Saturday of the month for our bike repair workshop! Learn to do your own tune ups, change tires, grease your chain, and other handy skills. To avoid the summer heat, we'll be in the Barrel Aging Room. Short fun ride may follow if you're up for it! Pronounced: bab-uh L; Sounds like: Babble or Babel; BABYL, Benjamin Jacobs, is an high energy singer/songwriter/entertainer based in Sarasota, FL. BABYL, also performs with musicians Jack Berry on bass, Thomas Nagy on Guitar, and Paul Shuler on Drums. Each musician displaying great on stage chemistry in a unique way. We'll have lots of fun stuff going on for American Craft Beer Week at PAW! Check back for more details as we get closer. ASI Improv Night @ PAW!